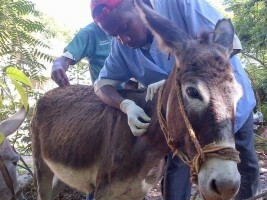 In 1986 there were only 4 Haitian veterinarians across the country, today there are about 70 that frame 1,565 community animal health workers who provide services at the 570 communal sections of the country. The strengthening of animal health programs have allowed to reduce losses due to animal diseases in livestock (among others: Coal, New castle, Classical Swine Fever, Teshen and parasitic diseases), to reduce the risk of animal diseasetransmission to humans and the risk of introduction of exotic diseases due to increased international trade. The draft law on modernization of health care services has been developed and provides for the creation of the "Health Agency of animals, plants and health food inspection", also a Draft Veterinary Public Health Code was prepared. Meanwhile the Ministry has decided to consolidate all directorates involved in animal and plant health protection within the Health Protection Unit (UPS). Presented to the Council of Ministers of the draft law on the modernization of health protection services and of Veterinary Public Health Code.